20 clams worth of Heaven. find it here. It's worth it. 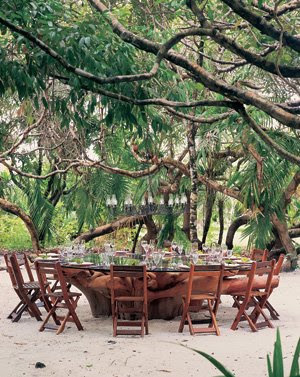 Now I would love to host a dinner party at that round table in the sand and under the trees with lots of candles as the sun sets! Happy Easter! are the first pics at your place? that is part of the beautiful, beautiful too! you got it going on girl! Wow! I must go take a peek at this book. Looks lovely. Ahhhhh... Happy Easter, sweet friend! I love books with a great cover shot that's display worthy..., this one definitely makes the cut! Everything you show is is heaven!!! I'll come hang with you anytime, Sister-friend. Your world is heaven to me. :) Thanks for the link to that gorgeous book, I'm off to check it out right now. i love the huge table !! That book looks great and you are right 'a little bit of heaven'! I love the huge round table! Seems a perfect way to get everyone in on the conversation. As a side note, almost my entire family (save for one brother, an aunt, and my mom) live on the eastern coast of Florida as well! Beautiful place! Just a suggestion, but perhaps sometime you could host a giveaway to one of the beautiful places featured on your blog? Love the table!! I would love to enjoy a fabulous dinner there! Another wonderfully beautiful post, Linda! I hope you never change the header on your beautiful blog. I'm carried away to the most beautiful places when I visit. Hope you have a wonderful Easter weekend. "Just hangin".... I love it. We are human beings, not human doings. I had a chat with a friend this week over tea and coffee and we stopped the world to be and connect. A great place...an interesting book with beautiful photos. That book looks delicious enough to digest! Ohhhhh......I can almost smell the air.